This one is for the GMs. 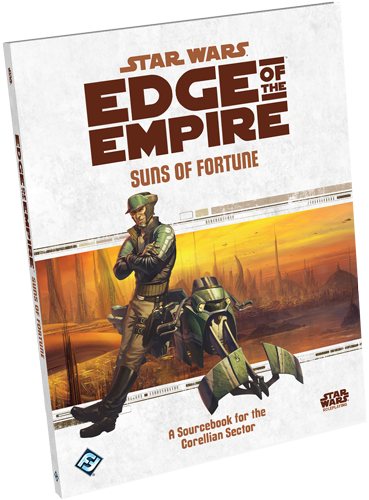 Edge of the Empire’s latest sourcebook is Suns of Fortune, detailing the planet Corellia, all the major planets in the system, and the planets beyond in the Corellian sector. Corellia is home to Han Solo and Wedge Antilles; as such, Corellians are known for their piloting skills. Unlike the previous source book for explorer characters Enter the Unknown, this book has only 16 pages of its 144 dedicated to player options, ships, species, and equipment. The majority of the book details planets and points of interest on those planets, as well as dangerous local fauna that will likely try and eat the party. Somewhat surprisingly, there is not a full-length adventure included in the book. Instead, this book provides several “modular encounters” which are set pieces that can be dropped in to a lot of different adventures, but definitely have a Corellian feel. Some of the more versatile encounters include a Sabacc game with some crafty card-sharks, a merchant transaction that gets spicy when a very unhappy customer shows up with the PCs caught in the middle, an encounter with local customs authorities while smuggling etc. Throughout the book there are lots of stats for adversaries in all sorts of situations, and lots of adventure seeds from descriptions of planets just off the beaten path. The new species are the Selonians, the Drall, and the Corellian human. The Corellian starts with a skill in piloting (space or planetary) and interestingly can train up to rank 3 during character generation which breaks the typical limit of two. The Drall seem like highly intelligent, note-taking Ewoks. The Selonians are like tall battle ferrets with a tail attack. I’m a bit underwhelmed by the few character options that are in the book. For a system known for building some of the best and fastest ships in the galaxy, there are precious few pages dedicated to them. There are a few airspeeders, landspeeders, and some stats for some mining vehicles, and a good mix of fighters, patrol boats, light freighters and one small capitol ship (the assassin corvette). I had imagined there would be more focus on the ships as that is what Corellia is known for. Overall, I think the focus and audience of this book is a lot more narrow than Enter the Unknown. Maybe my expectations were set higher from being so pleasantly surprised with the Explorer’s sourcebook. Unless you are a GM looking to please a group of PCs who want to play pilots and extensively explore one sector, this is probably a pass. The material is all here to build an entire Corellian campaign, but with the rest of the galaxy just a few parsecs away, why limit yourself? Today ended a successful Kickstarter campaign for Fat Dragon Games‘ medieval village of Ravenfell. The village of Ravenfell, and the products of the inevitable stretch goals, are paper modelling products: You print them, cut them, paste them, and viola! you’ve got as much scenery as you could possibly need (for that particular setting anyway). I got into this many years ago, and spent a week toiling away cutting out bits and pieces for my planned game of Assault on the Aerie of the Slave Lords. That module (30 year old spoiler alert) takes part largely in the Slaver City of Suderham, and several bars come into play. I printed and prepped several key barroom items and I was able to mix and match my way into the appearance of several unique appearing locations.This is before I sank unmentionable sums on the last Dwarven Forge Kickstarter, (in fact, it predated kickstarter) but I think it added something, and could potentially be quite worthwhile to produce decent scenery on the cheap. Paper Modelling is in some ways superior to your plaster and plastic backgrounds and scenery, in that they are objectively quite beautiful and not subject to your potentially substandard painting skills. You also have as much as you care to print, and could potentially manufacture an entire city for the price of the PDF and an ink cartridge (or two). I’ve been using Posterize to great effect to get the benefit of the beautiful maps from Paizo’s modules, as I stated a few blog posts ago, but this is a higher order entirely: Three dimensional, and now stacked in layers, if Fat Dragon’s Tom Tullis is to be believed. I clicked in at the “Beggar $1.00” level for a while before finally being sold to jump in at the Knight level at $50.00. It’s a lot for some PDF’s but I appreciate the effort and support the project. And what do kids really need with a college education anyway. There are significant downsides, to be sure. Paper modelling takes time. Precise cutting and gluing can be tedious work, and sometimes things don’t seem to come out quite how you expected they would. Ink isn’t cheap, either, and depending on your printer, you might wonder if you’re really saving money or not. Traditionally, the items are not as durable as a resin or plaster product (though are infinitely more replaceable) and can be tricky to store without crushing. Fat Dragon has apparently attempted to address this with collapsible pieces, which I look forward to giving a try. Should you choose to download a copy of their other products, I believe you’ll be pleased with the quality of the artwork, and you’ll find that your time invested can be richly rewarding. You’ll want to pick up a few items to complete your ‘kit’ for paper modelling. 1. “Self-healing” cutting mat – these come in various sizes and serve to protect your tabletop while allowing your blade to cut the template cleanly. 2. Exacto knife – You don’t want to try this with scissors…. you might have one of these already from your miniature modelling, which will save you a few bucks. A must for these sometimes complex templates. 3. Water based glue – a type of craft glue that is tough yet forgiving (you may want some super glue at some point for certain models, however). 4. Markers – You’ll find that darkening the edges of the scores and cuts that compose the corners of your models will drastically improve the quality of their appearance. 5. Metal Ruler – Typically with a cork back, this will avoid slipping while cutting and make sure your cuts are a little more clean. Consider going out and buying a set or taking a shot with the various free samples out there on the internet. You may find that you’ve got a new hobby, or at the very least the perfect prop for that encounter makes a particular encounter special. I recently received my copy of Intrigue at the Court of Chaos from our FLGS, and it is fairly unique among the other DCC adventures. Its difficult to write a review like this without giving away some serious spoilers, but I think I can tip-toe around the main ones and at least speak to the concept of the adventure. One thing I love about DCC is that a 1st level adventure can have you traveling between planes, and coming face to face with deities. 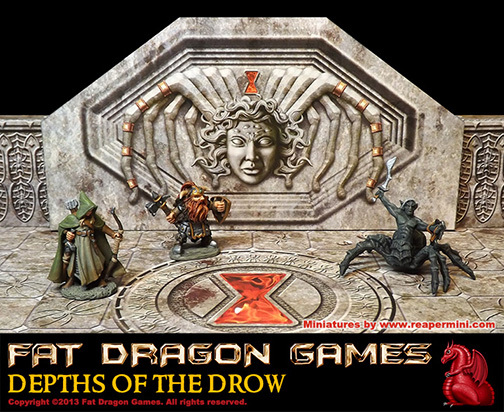 Normally RPGs reserve this for the very pinnacle of level advancement, with DCC all bets are off. I think the cover for this module is one of Doug Kovacs’ absolute best. The swirling colors and myriad of characters immediately tips you off that this is not going to be a typical dungeon delve. Also the first map on the inside cover is of the court of chaos, and rather than a typical compass rose indicating which direction is north, it simply states: “N = There is no North! All is Chaos!” This was apparently a note on the reference map from adventure author Michael Curtis that Doug left in. This is not a “beer and pretzels” kill the goblins in the cave and take their stuff 1st level adventure. This is much more cerebral and requires negotiation, and possible Player vs. Player in-fighting. The first part of this module is perfect for players who gush about not rolling a die for several hours and having it be the best RPG experience they have ever had. It certainly appeals to some, and definitely not to others. Essentially the party is charged with retrieving the Yokeless Egg from the Plane of Law, but the terms of this agreement and who in the party returns the egg to which member of the court brings about the intrigue. The second part of the adventure involves actually retrieving the egg itself, which is more of a typical delve, if anything can be described as typical in DCC. One of the challenges I really enjoyed encourages the GM to drop a lump of clay on the table and have the players form something from it to solve puzzle. You can also do it through a roll with bonuses depending on your PC’s profession, or use a combination of both, but I felt the actual clay would make for a memorable encounter. Most of the plane of law is very combat-light and puzzle-heavy. 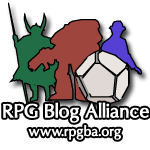 If your group is tired of the old combat slog through a monster-hotel, this will be a refreshing change of pace. If all your players want to do is slay legions of beastmen with 32+ spell check magic missle, this may not be the best adventure for them. There is a lot of potential to have one PC (accidentally or on purpose) leave the rest of the party stranded on the plane of law. There is also a lot of motivation for players to backstab (sometimes literally) the rest of their party for their own personal gain. (Hooray chaos!) There is a clear disclaimer at the beginning of the adventure that if your players “enjoyment of the game would be compromised” by such scheming, this is likely not the adventure for your table. I feel like both this, and the bonus adventure from the special edition of The 13th Skull called The Balance Blade could be exciting as a one-shot, but would be very challenging to integrate in to an existing campaign. Overall it is a very entertaining read, and for the right group would be a very memorable game, but it certainly isn’t for everyone.